It’s amazing what happens when people combine their passions with a vision to help others. That’s the story of the charity bike ride team Wheels4Water. On April 21, a team of cyclists from around the country will come together for a charity bike ride across the United States in the team’s biggest advancement to fight the global water crisis yet. 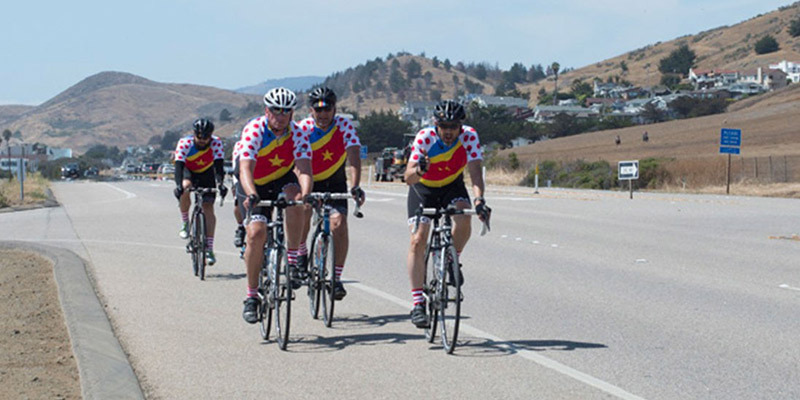 They will ride 9,000 miles over nine days from San Diego, CA to Charleston, South Carolina, with a goal of serving 9,000 schoolchildren with safe water and improved health in Bensa, Ethiopia. Wheels4Water co-founder and Lifewater board member Justin Ahrens shares that he came up with the idea while adjusting the water temperature of his shower and being struck by the fact that millions of people did not share that privilege, and did not have access to any safe water at all. “If I truly love my neighbor then I should try and help them live, and one of the basic things they need is water,” he said. Wheels4Water has worked with Lifewater since its inception. Ahrens has travelled with Wheels4Water co-founder Brian MacDonald to Uganda and the Democratic Republic of Congo (DRC) to see the need for safe water and Lifewater’s work first-hand. Since 2014 Wheels4Water has raised nearly $500,000, benefitting thousands of children, women, and men in Uganda and DRC. Each year since 2014 the group has cycled a different part of the United States and different team members have joined, but this is Wheels4Water’s longest charity bike ride and most ambitious goal yet. All funds raised will support schools in Bensa, Ethiopia to access safe water, sanitation, and hygiene. Bensa is home to some of the highest water scarcity and water-borne disease rates in the world. 65% of people lack access to clean water. The 2018 charity bike ride team has been training for months to work up the stamina to ride several hours and scores of miles each day. They begin early morning on April 21 and will ride continuously until the finish. Please pray for their safety on the road and strength through difficult weather and long miles. You can learn more about each rider, why they ride, support the ride, and get updates from wheels4water.org. The team is also selling cycling gear and designer posters to raise money. Mike is the founder and CEO of Corporate Color Printing in Orange County, CA which he founded at the ripe young age of 20. His true accomplishments however don’t lie in the fact that he has run a successful company for more than 20 years but rather in the man, husband and father he has become. Mike’s journey really began to change after traveling to Ethiopia and adopting his twins and seeing first hand the need for safe water and sanitation in rural Ethiopia. This ride is an extension of his servant heart and his desire to see lives changed through generosity. Not only those in Ethiopia, but also those who choose to partner with us and play a part in helping solve the water crisis in Ethiopia. Nate is a successful trainer and coach with Manwealth & Shield Maiden. He is on a path to continually push himself in all areas of life. Nate has always had a serving heart, to include serving our country on deployment for 15 months in Kuwait with the US Army as a 1st Lt. The thought of biking across the US to raise a significant amount of money with other like-minded men is very exciting, and scary at the same time. The lives that will be impacted through a great organization like Lifewater make it all worthwhile. Sean is a Senior Vice President of CBRE where he has spent the last 14 years advising companies on their global real estate strategy. As a core component of Sean’s faith, Sean believes it is his mission to “make wrong things right.” He feels called to make a difference in the world and sees the global water crisis simply as a math problem and a matter of the will. Though not an endurance athlete or a cyclist, Sean is excited to take this journey with the Wheels4Water team to help raise money and awareness for Lifewater International in the great work they are doing. Phil is a real estate investor and broker in Denver, CO. He has found it very rewarding to take part in a collective group target whose sole purpose is to give the less fortunate a chance at a better life. He felt so much satisfaction with being able to give back that when he was invited to take part in the Wheels4Water charity bike ride, he jumped on the opportunity. Phil believes we can ask, “What is the meaning of life?” or we can choose to show the world what we believe it to be with our actions. Rhett runs a successful mortgage team in Glendale, AZ and most recently completed his first full Ironman. He is passionate about serving others and is always looking for opportunities to serve a greater cause. When asked by a dear friend if he would support his charity bike ride across America to bring awareness to Ethiopia’s lack of clean water and facilities for basic restrooms, he was in from the get-go. After seeing an impact on a water tower, education, and the sustainability of a village in Cambodia, Rhett found the need to serve the awesome cause even further. Scott Hohensinner | Summit Packaging, Inc.
Scott is the owner and president of Summit Packaging, Inc., which he founded in 1998. He is excited and honored to be a member of the Wheels4Water and Lifewater team in helping spread awareness about the need for clean water in many parts of the world. He joined Wheels4Water after learning from his fellow riders about the urgent need for clean water and sanitation in Bensa, Ethiopia. Their guidance and inspiration motivated him to take on this challenge. He’s grateful to be involved with a project that will directly and tangibly improve the lives and health of thousands of children by providing them with resources most of us take for granted. Additionally, Wheels 4 Water’s 2018 is sponsored by many great businesses around the country. Find them and join them here.